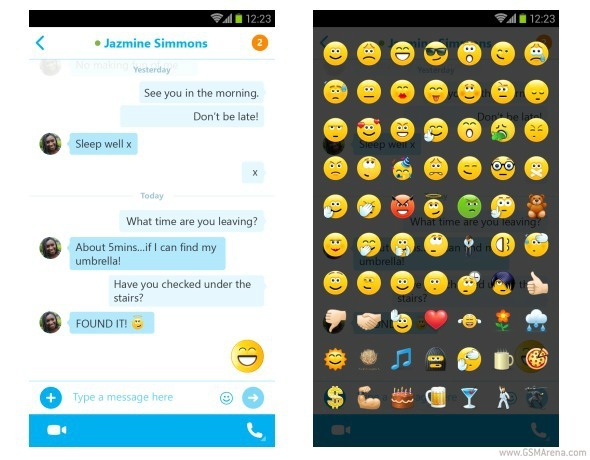 For example, Skype 5.3 for Android gives you a new bubble-style chat layout, similar to the one already employed in the iOS and desktop apps. It also receives support for emoji, so you can express yourself better. If an emoticon is the only thing you send in a message, soon it will transform into a large animated version (this feature is in the process of rolling out). When connected to Android Auto, Skype now supports speech to text. A few smaller things are in too, such as chats no longer auto-scrolling when you receive a new message, the ability to view and change the avatars for all of your group chats, and needing to re-enter both your username and your password after signing out. On the iOS side, Skype 5.12 for iPhone has additional language support, with Croatian, Slovak, Catalan, Vietnamese, Thai, Hindi, Greek, Hungarian, Indonesian, Malay, Turkish, and Estonian being added “within the coming week”. Last but not least, Skype Qik (the 42-second video app) gets eight new effects you can use while recording yourself. You can even switch from one to another while recording. This functionality is built into updates for Android, iOS, as well as Windows Phone.